Add a magical element to your day, using glamorous and exciting transportation. If you have a friend, family member or partner with a special birthday coming up why not give them a day of fantastic memories that will stay with them for years to come! Atlas Helicopters can help you organise a very special day for you and your loved one. We plan the departure, arrival, in-flight catering and can also book the hotel and entertainment at the destination. You can stay the day, or the night, and Altas will fly you back home. Each journey is filled with fantastic views, giving you a great sense of freedom and memories to last a lifetime. The couple to the right recently celebrated a 50th birthday at the Priory Bay Hotel. They were flown from Selborne with an overnight return. But you don’t have to limit the experience to this country. With Paris the same flight time as Manchester there are many European destinations that Atlas can fly you to. 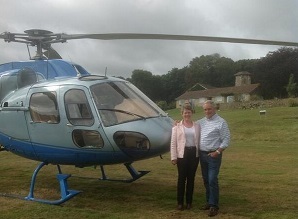 We recently organised a surprise 50th Birthday trip to Paris, featuring three helicopters, 15 guest and a weekend of sights and entertainment in the City of Light. You can see the photographs and the details on this page: Amazing Surprise 50th Birthday Trip to Paris. Atlas Helicopters can pick you up from a location near the party person’s home or office. Your own personal flight manager is available 24 hours a day so you can make small adjustments as your birthday plans develop, and they’ll handle your arrangements discreetly to make sure birthday surprises remain secret. Our flexible booking service enables you to tailor your flight arrangements to suit your plans and needs.